The eagle-eyed amongst you may have noticed there are two gloves and a third on the way. 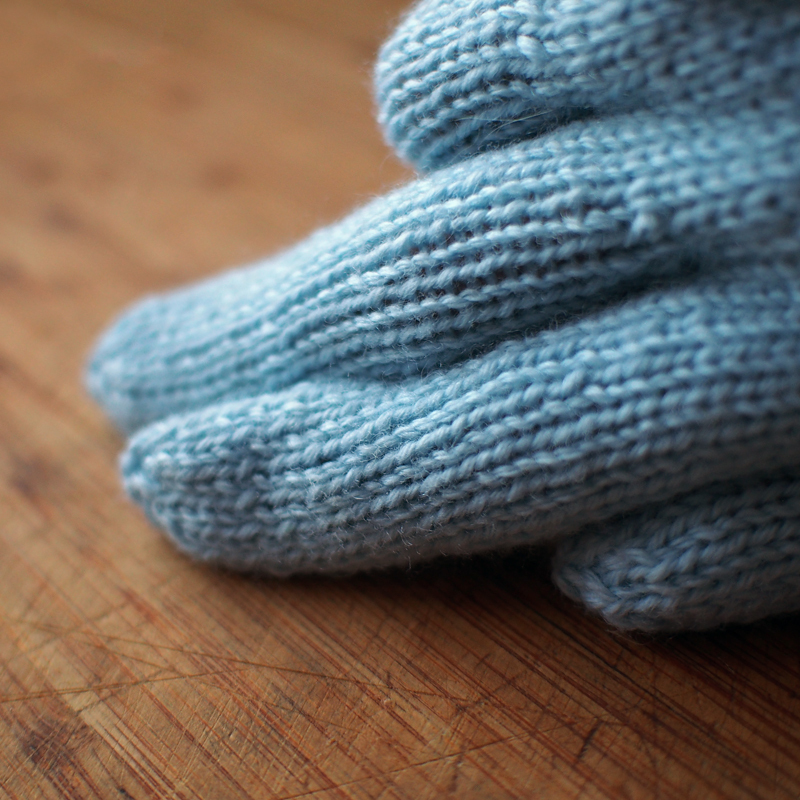 You may also have spotted that the two completed gloves are for a right hand. Am I, perhaps, knitting a set for a three-handed person? Or for someone who has a habit of losing their right-hand glove? No, I just made extra work for myself by not triple-checking what I was doing when I got to the middle finger of the first glove. I was supposed to have eighteen stitches on my needles and a brief count came up with seventeen, so I counted again… and got eighteen, somehow. Well, quite a lot, it turns out. It’s noticably tight once it’s all sewn up and you can see the stitches pulling much further than they do on the other fingers, as demonstrated in the photo below. It is ridiculously difficult to take photos of your own hands when one’s in a glove and the other’s holding a camera. I ended up having to fetch a mini-tripod and it wasn’t that much help. You can still see the difference in the two out-stretched fingers, though: on the index finger, the stitches are nestled together cosily; on the middle finger above, there are wide gaps. The perfectionist in me cannot deal with this, especially given that these gloves are to be a present. So a second right glove happened. 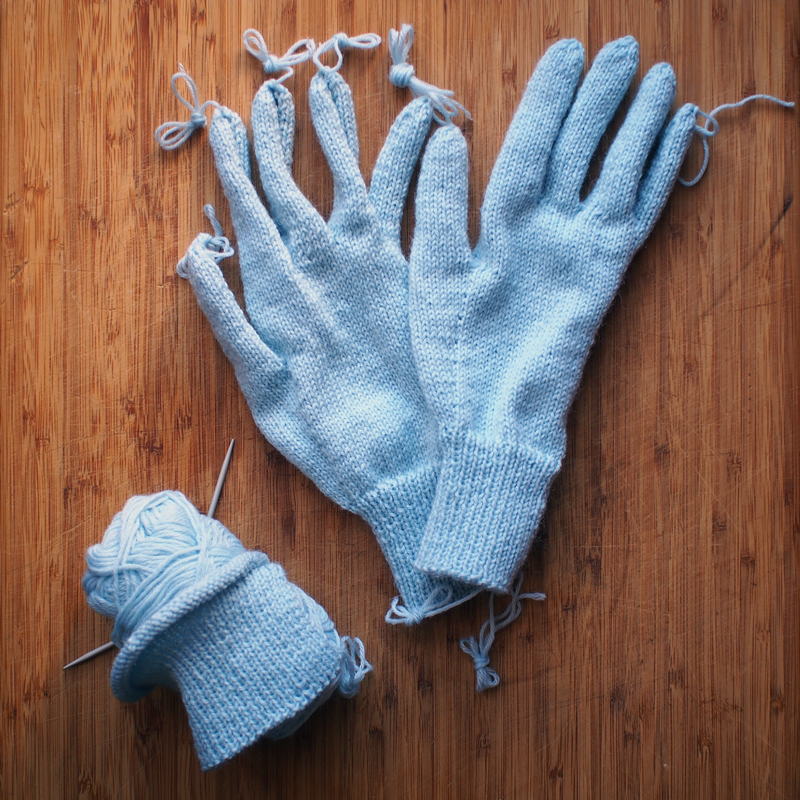 Luckily, gloves are quick to knit up so the set should be finished soon, at which point I will stare at them and wish I was going to keep them myself. This will be swiftly followed by the wrapping up of said gloves, lest they mysteriously work their way into my wardrobe. Or the box that should be packed full of said wardrobe, ready for its journey. 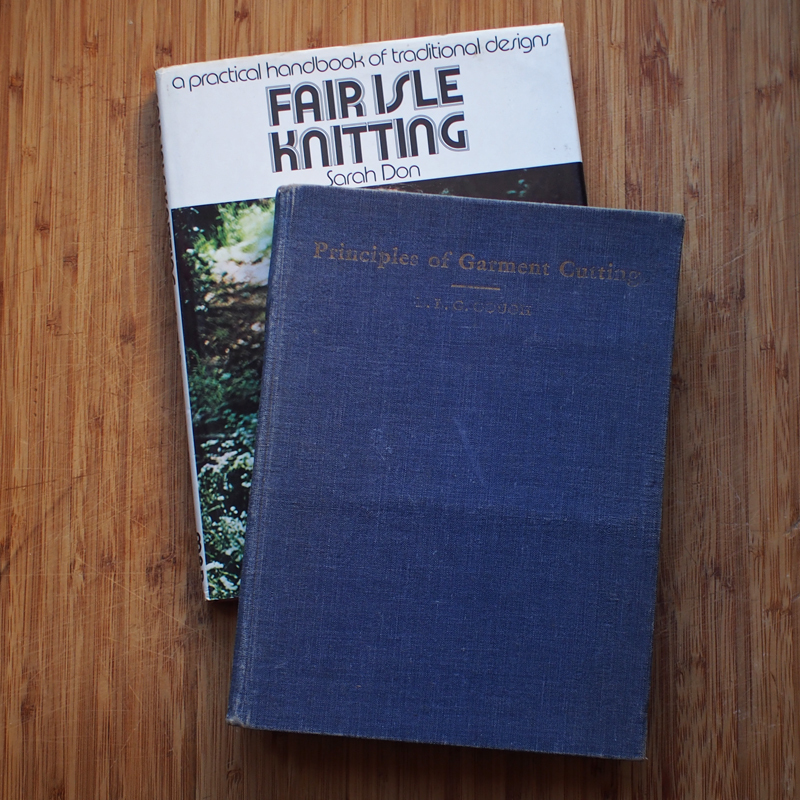 It’s a bit tricky to read the title of the blue book, but it is Principles of Garment Cutting by E. L. G. Gough, who was (according to the introduction) Lecturer-in-Charge, Women’s Handicrafts Department, Technical Education Branch, Department of Education, New South Wales. The book was published in 1943 and is full of glorious diagrams and instructions, as it was intended to be a textbook to accompany the classes run by the Women’s Handicrafts Department. It also includes a whole section on capes, which makes it my kind of book. It cost me a whole two dollars, as did the Fair Isle book underneath it. The best part of Principles of Garment Cutting was a discovery I made as I was flipping through the pages: nestled towards the back was a negative, which I promptly photographed and brought back to life via the magic of Photoshop. I love this photograph and all its attendant mysteries. Who was this lady? Was she the owner of the book? Did she use the book to make her lovely dress? She has such a lovely smile and it’s lovely to imagine that she might have been the book’s original owner. And now, I fear it is time to go back to staring hopelessly at empty packing boxes. I am amazed that you can knit! I always mess it up! 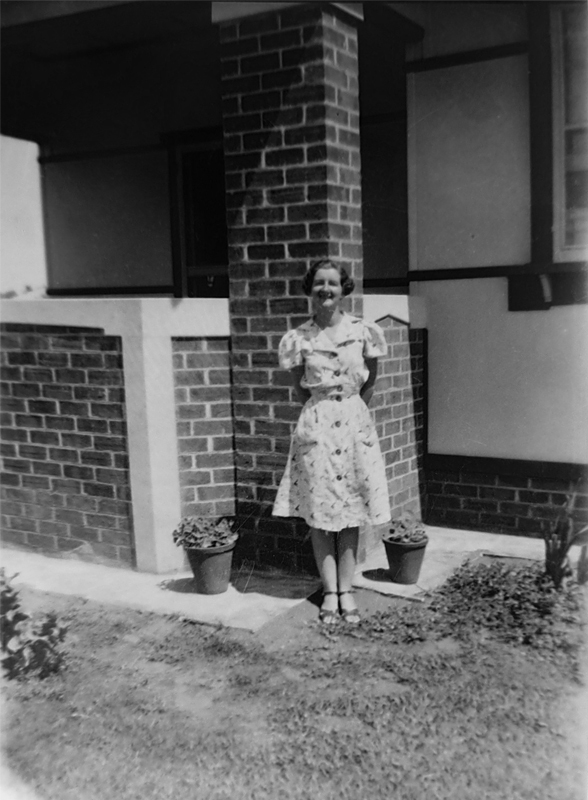 I think the lady is showing off a dress that she has made! I absolutely love knitting – it’s so good for you (and not just because you end up with lovely knitted garments at the end of it). You are surely right about the lady showing off her dress. She’s a sewing blogger well ahead of her time, I think.